12:36 ET: The latest reports say Mubarak is in Cairo and meeting with Omar Suleiman. Mubarak is expected to announce his resignation in as little as 30 minutes. He may hand power to Vice President Omar Suleiman OR to the military. 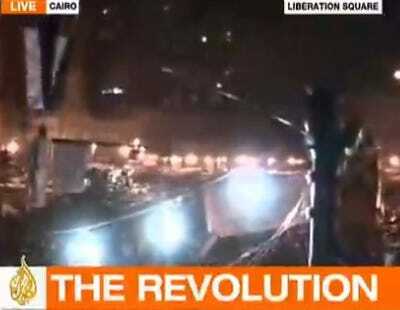 11:51 ET: The Egyptian military has stepped in to “safeguard the country,” according to Al-Jazeera. Mubarak still hasn’t been seen. 11:23 ET: A retired general on Al-Jazeera says the council meeting without Mubarak is clear indication that the president is out of power. He says that the council will secure demands of the people with a peaceful and legal transfer of power. He insists the will of VP Suleiman and the military council are the same. 11:05 ET: The head of Egypt’s National Democratic Party personally asked Hosni Mubarak to transfer power — and expects him to do so tonight. The head of the CIA also expects him to resign tonight. However, Egypt’s information minister tells Reuters he will not. We’re still waiting on a planned statement from the Army. 10:50 ET:: Egypt’s army leaders have convened in an meeting led by the defence Minister Mohamed Tantawi according to Al-Jazeera. Earlier Hassan al-Roweni, an Egyptian army commander, told protesters in the square on Thursday that “everything you want will be realised,” according to Al-Jazeera. This statement was met with a roar of approval from the crowd. Mubarak, who stepped down as head of the military earlier today, is not expected to be present at this announcement. The question going across twitter and everyone’s mind is: Was this a coup? Will the army chiefs yield power? Vice President Omar Suleiman said earlier that if protesters did not enter into dialogue with the Mubarak government, the army may be forced into carrying out a coup — although he claims this statement was taken out of context. According to a discussion about constitutional succession on Al-Jazeera, if Mubarak steps down, elections would have to be held in the next 60 days. However, NDP is the only party that could run a candidate.